I passed Nallur Road every week on my way to Upper East Coast Road. It was quite boring seeing the same scene over and over again. Recently I browsed throught an album that had pictures of my in-laws' house at Nallur Road. It brought me memories that was about half a century ago. My children were very young then and my in-laws helped to look after them during the day. The beach was within walking distance and very often our children played there building sand castles and digging sea shells. When not playing the sand we walked and run on the beach. Unlike Changi beach, there were very few outsiders. Those frequented the beach were residents of Nallur Road and a nearby Chinese kampong. Nallur Road was then a no-through road. The houses there were mostly bungalows with large compounds. My children were very lucky that their grand-parents lived there. They enjoyed the open space riding bicycles and running around. Furthermore, I had a dog and 2 rabbits for them to play with. They also played with other kids on the road. Children made friends easily and the adults got to know their neighbours through them. 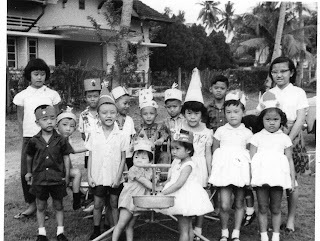 When my eldest daughter was 2 year old we celebrated her birthday and invited friends and their children to her birthday party. It was my first time holding a birthday party for kid and was at a lost. I had to think of the games children played and made the props myself. It was stressful but worth it as I made all the kids happy that day. The sea at the end of Nallur Road has gone due land reclamation. The bungalows on both sides of the road made way to a number of condominiums. At the twinkling of an eye about 46 years have passed by. The landscape have changed and I am getting more grey hairs. Now when I pass Nallur Road happy scenes flash through my mind. Thanks for sharing the memories and photos. 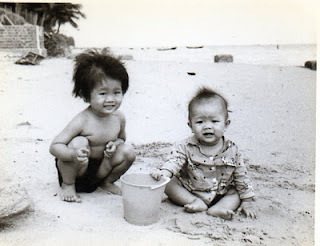 Hard to believe that there were actually houses in Spore where the backyard was the beach. I remember visiting a classmate's house in West Coast Rd. and there were steps in his garden leading to the sea. And we went swimming just like that. 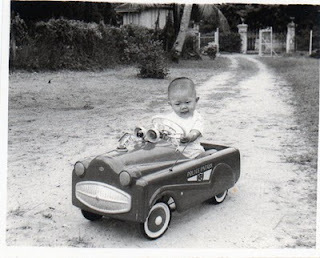 Who is the kids in the toy car? 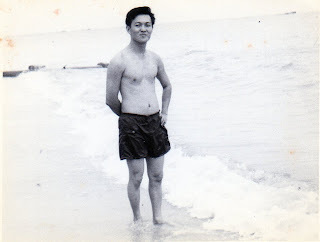 I have a foto just like that of my eldest brother. I would think that belonged to your generation and not your children's. He is my son who attended your class at NPB Bukit Merah when he was with DHL. 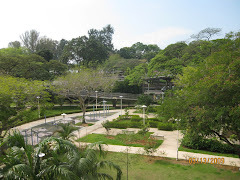 when i went with my blogger friend wee kiat to take photographs of the old sea-wall, i saw a section of the old steps. 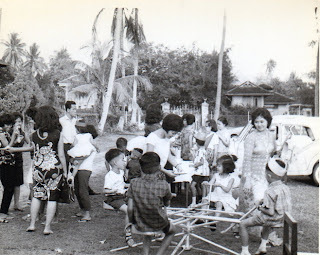 Great collection of the treasure photos of "nong nong ago"....nostalgic! Thanks Philip. Sad to see Nallur Road widened until what it is today. More sad to se only #13 bungalow remaining plus this small Manor house facing the tyre shop. 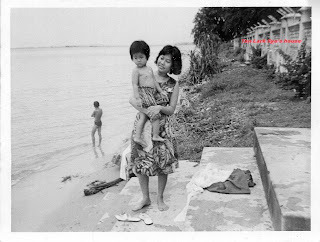 I used to come hear to swim and hung our clothes at that seawall (you refer to Mr. Tan's bungalow) before land reclamation. 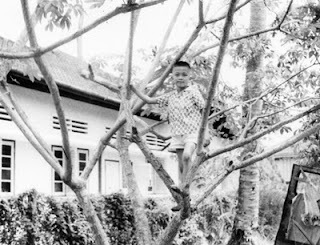 One time cannot control had to do my thing in the bush (I think it was the kindergarten today).